I am a mom of a son with multiple disabilities. This means that, by definition, I am a school choice supporter. Nobody bothered me and my husband when we pursued school choice. Nobody tried to disparage our reputations or vilify us. Nobody tried to stop us from making choices; in fact, they supported us. Yet groups like NJEA, Education Law Center, and Save our Schools-NJ disparage low-income families and racial minorities who want what we got and vilify the schools they choose. Why are special needs parents privileged over other parents who conclude, like us, that their traditional district schools can’t meet their children’s needs? Let me explain. For those blissfully ignorant of the special needs world, sometimes a child classified as eligible for special education won’t be able to academically benefit from a typical classroom. Sometimes that child won’t benefit from a typical school. (I’m not talking mild learning disabilities — think global developmental delays, in our son’s case stemming from a genetic mutation called Fragile X Syndrome.) After a child is classified, a district Child Study Team, whose most important members are the child’s parents, compiles a voluminous document called an IEP (Individualized Education Plan) that lists annual learning goals, objectives, measurements of progress, therapies, and accommodations. Then everyone decides where those objectives and goals would best be met. In a typical classroom with the support of a one-on-one aide? In a self-contained classroom with other similarly-handicapped kids? In another district’s program? In one of New Jersey’s many private special education schools? My husband and I had the power to insist on the best school for our child at district expense because his needs outstripped our district’s capacity. Our son has attended a county special services school, a private school, an out-of-district transitions program, and our local district schools too, with lots of supports, accommodations, and individualized curricula. By law, cost is irrelevant when making placement decisions (although some NJ private special education schools charge close to — or more than — $100,000 per year). There’s no judgement, no politicking, no NJEA and Education Law Center accusing us of stealing resources from the traditional district school, no Save Our Schools-NJ accusing us of bypassing community votes on our choice, no academics professing segregatory impact (an argument losing steam not only for its statistically-innumerate claims but also because some African-American parents are touting the educational superiority of Afrocentric schools: see here and here). We just get to choose the best publicly-supported school for our kid. We have school choice. 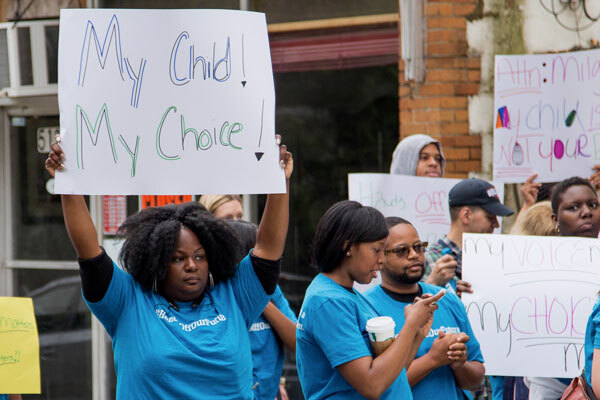 But other parents of typical children, disproportionately low-income and of color, who believe their children’s academic needs outstrip traditional school capacity, are thwarted in their quest for school choice because of the power of special interest groups. Here’s another difference between us and the majority of those who desperately seek seats in urban charter schools. We are white. We are middle-class. We live in a good school district. We know that federal law mandates that our son be placed in the “least restrictive environment” where he can best benefit from a “free and appropriate” education. We’ve had the luxury of time and resources to research a variety of potential placements. We feel entitled to advocate for our child, regardless of resistance. But mostly we are privileged because we have the inalienable right to make school choices for our son. It’s another story if you live in the school district that abuts ours, the state capital of Trenton where three in four third-graders don’t read at at grade-level. There, the only other choice (besides a scholarship to a private/parochial school or finding the resources to move to a better district) is public charter schools. Right now Trenton charter schools have a wait list of 1,200 children, which is 10 percent of all district students. Yet late this past September Education Commissioner Lamont Repollet, the sole authorizer of charter schools, failed to follow his own Department’s rules and blocked the approval of a Trenton charter school that met all qualifications. They level these criticisms while comfortably set up in communities that provide a quality education for their children in nonintegrated or white-dominated schools. They somehow conveniently forget that many of these all-black or -brown charter schools bring good schools into communities that have been underserved and neglected for years. These age-old battles will go on while, in the meantime, the pain that defines so many of our children’s existence will continue. Gov. Phil Murphy hasn’t approved any new charter schools since his inauguration, despite a wait list of 35,000 students. The DOE’s “Charter School Act Review” — the ostensible reason for his moratorium — is floating somewhere within the bowels of this dysfunctional department, even though changes to the law must be proposed and approved by the Legislature. You shouldn’t be required to have a child with significant special needs in order to exercise public school choice. You shouldn’t have to be able to afford a high-priced home to have the right to choose. You shouldn’t have to wait for your governor to grow a set and distance himself from anti-choice lobbying groups. But you do. That’s wrong in every way. Next week is National School Choice Week. New Jersey’s annual conference, at the College of New Jersey, is focused on school choice for special needs children. I’ll be there (and on the first panel); if you want to register click here. How do you know what I would choose for my kids? If there were a KIPP around here, we would have certainly considered it as a public school alternative. (Have you ever been to a KIPP school? If you had, you’d know there’s no “slick advertising” or “false promises.”) And I’ve never claimed that charters were a “panacea” of anything. Most children will always attend traditional schools. That’s why we can’t settle for what we have. And we can learn some good lessons from other public schools that have more autonomy in exchange for more accountability. You are comparing your experience with special education (SE) classified children in wealthy districts with the experience of general education children in poor districts. You are also asserting that you as a parent were able to determine for the public school system what school your SE classified child would attend and what services it was compelled to provide, due to some Choice program for SE that you imply exists. Your assertion is false. It doesn’t work that way and you know it. The school determines what is appropriate and the rules are the same in all districts. You can advocate, you can appeal, you can sue, you can even get elected to the school board, but you don’t get to run the show. There is no mandated school choice program for SE. In poor districts, the same IDEA rules apply. So you suggest that offerings are better for white people in affluent districts? No kidding. $ome mystery, huh? You wouldn’t choose KIPP for your kids. If you want to exploit your personal experience of school choice as a way to make some point about equal opportunity, then have some intellectual integrity. You can champion vouchers for the price of tuition at Princeton Day School for all the kids in the state. K? Otherwise, acknowledge that financial constraints on the public purse apply. Then you can tell us how charters represent the panacea of free markets and face down your opponents who will tell you about ravaging a public good on the backs of the poor with slick advertising and false promises. At least that debate would approximate a more rational discussion.